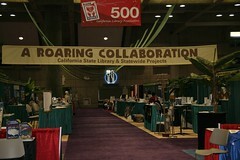 The California Library Association held its annual conference this past weekend in Sacramento. Infopeople, along with the California State Library’s other LSTA-funded state projects were there, and we all shared a joint booth area that we called, “A Roaring Collaboration.” It was a blast! One of the new things we did this year was to put on a “Technology Petting Zoo,” where we had a lot of devices from MP3 players to ergonomic keyboards on display for people to hold and actually use (you could pet them too, of course). Beth Gallaway, Information Goddess, came (thanks, Beth!) and was an enormous all-around help but most importantly was the resident expert and tour guide of our Second Life demo. Michael Stephens of Tame the Web gave a great, very well-attended talk and mentioned Second Life and Beth which needless to say kept her a very busy person! This was the first time we’ve ever done anything like the zoo, and while everyone enjoyed it, we see a lot of room for improvement, and hope to do it again next year with new and different items. Beth started a Flickr group for CLA 2006 photos, which you can view here. I’ve posted a bunch of photos (which are also part of the Flickr group) here. We also managed to capture on film the inimitable Margaret Miles leading a room full of librarians in the “library cheer.” Check it out on YouTube here!